Creamy Coconut "scrubby" bubble exfoliates skin and cleanse all in one motion. Fresh smell awakens you and your skin. No oil in this scrub. Works as a soap & scrub in one. Use this in replace of your soap. Sugar based, 8oz. Directions for use: Scoop a small amount onto palm and massage into skin. For best results use with Natural Paradise Whipped body butter in Coconut. Directions for use: Scoop a small amount onto palm and massage into skin. For best results use with Natural Paradise Cocoa Butter Lotion in "Pumeria"
Vanilla "scrubby" bubble exfoliates skin and cleans all in one motion. Fresh smell awakens you and your skin. No oil in this scrub. Works as a soap & scrub in one. This scent is a perfect blend of Vanilla Cupcake and Frosting mix. Sugar based, 8oz. Directions for use: Scoop a small amount onto palm and massage into skin. For best results use with Natural Paradise Cupcake Body Butter. Banana "scrubby" bubble exfoliates skin and cleans all in one motion. Fresh smell awakens you and your skin. No oil in this scrub. Works as a soap & scrub in one. This scent is a fresh scent of Bananas! Sugar based,8 oz. Directions for use: Scoop a small amount onto palm and massage into skin. For best results use with Natural Paradise Banana Body Butter. Our Hawaiian Ginger Aloha Walnut Body Scrub is a luxuriously thick and creamy textured body scrub that is designed to help detox and exfoliate the body, revealing a new layer of smooth, shiny, healthy skin. Walnut Based, 8oz. Hawaiian Ginger is our #1 TOP SELLER! a lovely scent, very floral yet beach fragrance to it. Coconut, mixed with flowers, honey suckle and Lillie's mixed in. All together though you get what smells like a tropical beach side. Refresh tired dry skin and wake up to a new you! Aloha!!!!! We don't skimp out on the amount of crushed walnut. Every single scoop of this scrub will slowly and gently remove dead skin cells and dirt leaving the skin soft, cleansed and hydrated. This all-over body scrub is cream based and is ideal for dry skin. Try our Hawaiian Ginger Body butter & Soy Candles. Our Plumeria Aloha Walnut Body Scrub is a luxuriously thick and creamy textured body scrub that is designed to help detox and exfoliate the body, revealing a new layer of smooth, shiny, healthy skin. Walnut based, 8oz. Plumeria is a wonderful Hawaiian flower, once you smell this you will wanna Hula! Try our Plumeria body wash, Cocoa Butter lotion & Soy Candles. 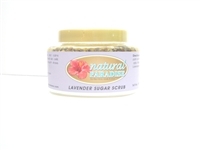 Lavender soothes and calms skin, while sugar exfoliates dead skin cells. Use before shaving legs for a smooth shave. Organic Lavender buds & essential Lavender oil helps restore skin and relax the body.Sugar based, 8 oz. Directions for use: Scoop a small amount onto skin and massage into skin. For best results use weekly. This organic body scrub exfoliates and moisturizes, leaving your skin feeling silky smooth. No need for lotion after this fabulous body scrub. Honey & Shea Butter hydrates skin while brown sugar gently exfoliates dry skin. Brown Sugar based, 8oz. Directions for use: Scoop a small amount onto palm and massage into skin. For best results use weekly. 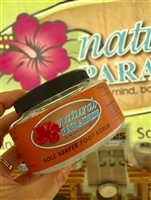 Sole Surfer Foot Scrub "scrubby" bubble exfoliates heels and cleans all in one motion. Fresh smell of Essential Mint oil awakens tired dry feet n heels. Sugar based, 8oz. Directions for use: Scoop a small amount onto palm or pumice stone and massage onto feet n heels. For best results use with Natural Paradise Coconut Body Butter.